In this recipe, we take a timeless New York steak and elevate it by cooking sous vide. Then, we top it with incredibly delicious homemade chimichurri to really take it to the next level. For this cook, we did a very basic salt and pepper rub to let the taste of the meat shine. And boy it shines. But if we want to take our New York steak straight to Flavortown, we like to use our favorite seasoning blend, Meat Church, to kick the flavor up a notch. Through loads of experimentation, we’ve found that cooking the steak at 129F for 1 hour is the perfect combo. 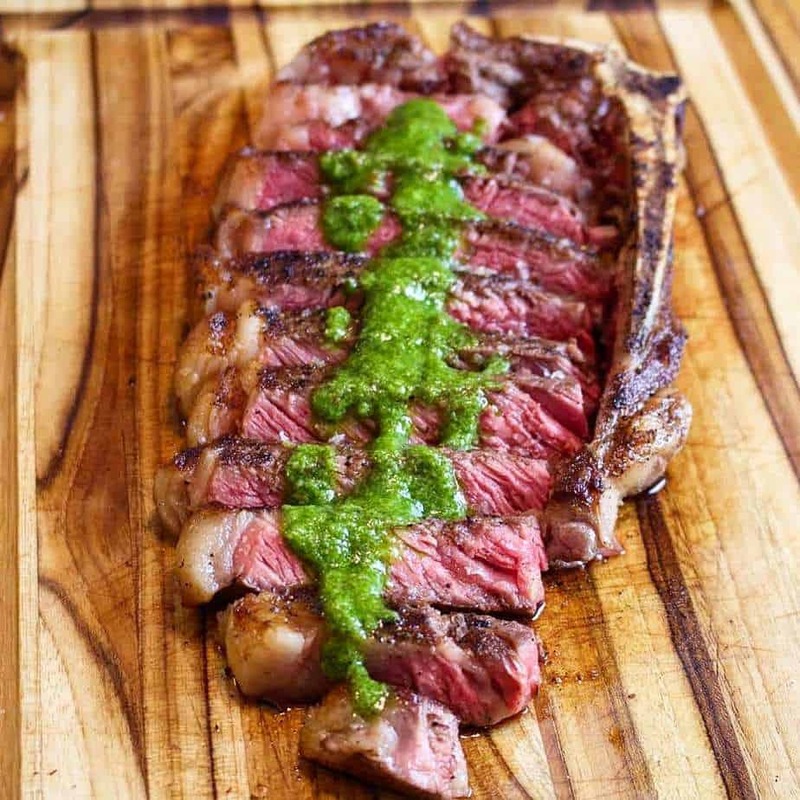 Leaving the steak in for an hour breaks down the connective tissue (collagen), which results in a super tender steak. Also, cooking them at a temperature of 129F is the sweet spot for that perfect edge to edge rosy color. Just make sure you have a reliable sous vide that accurately regulates the temperature of the bath or your results may vary (check out the Anova or Joule). For other time and temperature options, check out our cooking guide here. Cast Iron Skillet – If you are looking to take your searing game to the next level, we recommend investing in a cast iron skillet. By using a cast iron in this recipe, you’ll achieve a deep sear on the steak. Cast irons are also extremely handy for searing just about any and all sous vide meat. Lodge offers the best quality and price, which is why it is our favorite cast iron brand. Pluck off parsley leaves from the stem. Add parsley, chopped garlic, olive oil, red wine vinegar and red pepper flakes in food processor or blender. Blend until the ingredients are finely chopped. Salt and pepper to taste. Set aside 1 to 2 hours to emulsify flavors. Set sous vide machine to 54C/129F. Salt and pepper the steak. Put the steak in a freezer bag, and remove the air through a vacuum sealer or the displacement method. Place steak in the bath. Cook for 1 -2 hours. Serve steak topped with chimichurri sauce and enjoy! This chimichurri recipe is incredible! Also the steak is perfectly cooked. Thanks a ton for this! I don’t think I can make steak any other way now. This was amazing!